Orchid grower George Ota of S&W Orchids in Waianae arranged orchids Friday afternoon during an orchid show at Ewa Elementary School. EVEN THOUGH Hawaii's flower and nursery industry enjoyed their best year ever in 2005, some nursery operators say they fear their industry will go the way of sugar and pineapple after a federal judge rejected their bid to block Taiwanese imports. On June 29, U.S. District Court Judge Royce Lamberth in Washington, D.C., ruled against Hawaii growers who sued the U.S. Department of Agriculture trying to stop the importation of potted orchids from Taiwan. It was the second such court setback for the growers. The Hawaii Orchid Growers Association alleged that the department did not fully consider the impact of insects and other invasive pests potentially introduced to Hawaii by orchids growing in moss and other potting material from Taiwan. One of the orchids shown Friday afternoon during a show at Ewa Elementary School. 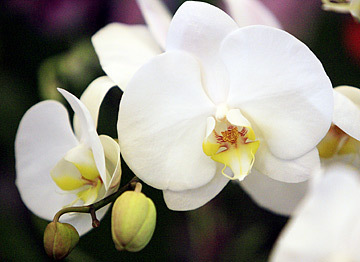 In 2004 the Agriculture Department, at the request of the Taiwanese government, changed a plant quarantine rule to allow the importation of the phalaenopsis, or moth, orchid in potting materials like moss. Because they can be shipped in potting material, the orchid plants can now be sent to the United States by sea in shipping containers, cutting costs for the Taiwanese growers and allowing the mass importation of phalaenopsis orchids. Big Island orchid grower Leonard Gines said he fears the rule change is just the beginning and that other plants will be allowed to be shipped in potting materials, eventually threatening the entire Hawaii nursery industry. The other threat to the industry is that biting midges or plant diseases could hide in the growing material and be introduced to Hawaii from Taiwan, according to Gines and state agriculture officials. Last year, Hawaii growers lost their first lawsuit seeking a restraining order against the rule change. Now the Hawaii growers have 60 days to decide if they want to appeal the decision in the second lawsuit and are polling the 144 members of the association about whether to continue. The cost to appeal is about $4,000, and the vote could be close. Some members say they believe the lawsuit is a waste of time and money. Richard Takafuji of the Orchid Center in Waianae said his business will survive by selling to local stores and consumers even against competition from Taiwan. "We're still producing a product that has relatively high value," he said. "We got this little niche." 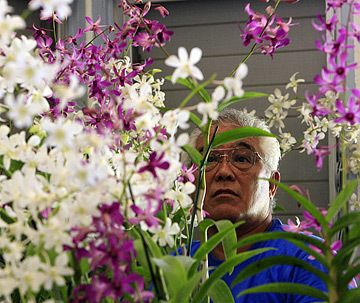 Takafuji noted that Taiwanese orchids have been coming in to the mainland since last year, but he said the cost of shipping the orchids from California keeps the price of locally grown orchids competitive. U.S. Agriculture Department officials say there have been no direct imports of orchids from Taiwan to Hawaii so far. However, Carol Okada of the state Agriculture Department plant quarantine branch said she has received inquiries from local growers who are looking into bringing potted orchids from Taiwan. Okada said the state's lawyers reviewed the lawsuit and decided not to join it. However, the state filed an amicus brief and technical assistance from a University of Hawaii researcher in support of the growers' arguments. Gines said the state should be doing more to protect the nursery business. Sales for Hawaii's flower and nursery industry topped $100 million in 2005. "We're talking about a substantial industry, and they're not willing to help," Gines said. "It seems to me that it's in their best interest to help us out." But Okada said the state Department of Agriculture has to follow the advice of the state's attorneys. The state's focus is now on trying to set up a joint inspection center so that state inspectors can look at shipments of foreign orchids and other plants alongside federal inspectors, Okada said. "We have to work with the USDA. There is no other way," Okada said. "Working within the same facility, we are more likely to see something they had missed." Okada said the USDA has 450 staff members, but most are inspecting products leaving Hawaii and only 10 are looking at products coming into the state. The state Legislature approved funds for 56 more positions in anticipation of the establishment of a joint inspection facility, Okada said. At last weekend's Ewa Orchid Society plant show, business was brisk for local orchid growers who were selling plants at the show. In between sales, the growers talked with each other about the future of their business. 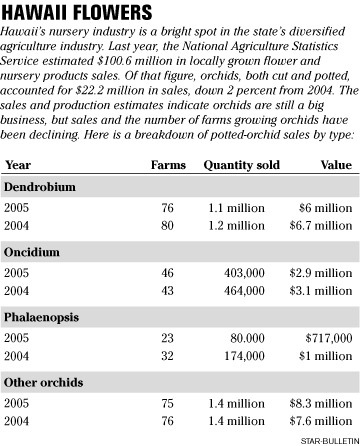 Agriculture statistics show local orchid sales have declined from $23.4 million in 2003 to $22.2 million last year, but that figure also includes cut flowers. Local agriculture statistics show some growers are apparently switching their production away from potted phalaenopsis plants in anticipation of Taiwanese competition. In 2004 there were 32 farms in Hawaii that reporting raising and selling phalaenopsis plants. But last year, only 23 farms raised the orchid variety, and sales dropped from 174,000 plants with a value of $1 million in 2004 to $717,000 for the sale of about 80,000 phalaenopsis plants last year. Carmela Watanabe of S&W Orchids Inc. said the price locally for phalaenopsis orchids has not changed. However, her company also sells plants at mainland orchid shows, and Watanabe said she no longer brings phalaenopsis orchids from Hawaii to sell on the mainland because prices have dropped since the rule change. Orchid plants that she used to sell for $50 to $75 now command only $20 on the mainland, Watanabe said. It is really just making conversation, and no one is seriously looking at getting out of the business for now, Watanabe said. "But when we talk with each other, we're talking about what we're going to raise next."